ICHRI: A source told the International Campaign for Human Rights in Iran that Habibollah Golparipour, a death row Kurdish prisoner, has been barred from having in-person visits with his family for the past three months. After repeated requests addressed to prison authorities, the Chief Warden agreed to allowing him visitations and his family traveled from Sananjdaj to Semnan to visit with their son, but despite presenting the written approval, the family were kept waiting outside the prison gates until 4:00 p.m., and then informed that business hours were over. Therefore they could not see Golparipour. According to the source, a human rights activist, after Habibollah Golparipour's sudden transfer from the Central Oruymiyeh Prison to Semnan Prison, he has faced many limitations, including restricting his telephone access to his family. The source who is familiar with Golparipour's case also claimed that Semnan Prison's Security Unit has also accused him of "doing propaganda inside the prison," and threatened him with execution. On September 27, 2007, Mahabad IRGC Intelligence Unit forces arrested Habibollah Golparipour at the Mahabad Terminal and subsequently detained him inside Mahabad, Orumiyeh, and Sanandaj security detention centers for several months. Sources close to Habibollah Golparipour's family told the Campaign that during his arrest, "he was subjected to the most severe physical and psychological torture, to the point that his arm and leg were broken under torture." 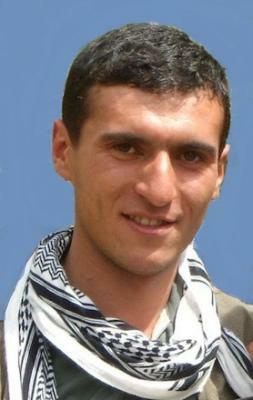 Golparipour was then transferred to Mahabad Prison and was sentenced to death by Branch One of Mahabad Revolutionary Court on charges of "membership in the Kurdish Independent Life Party (PJAK)," and "organizing the Kurdish Peace Mothers in Mahabad," on March 14, 2010. To object to his death sentence, the Kurdish prisoner of conscience embarked on a 15-day hunger strike on February 11, 2011. His case was referred to the Supreme Court, where it was confirmed in full. According to sources close to Golparipour, he was transferred to the Orumiyeh Central Prison on December 3, 2010, and on March 15, 2012, he was abruptly moved to the Semnan Central Prison. Habibollah Golparipour is currently held in Ward One of Semnan Prison among regular prisoners. Sattar Beheshti's mother says that they came to the house and threatened her that if she didn't drop the charges they would take her daughter away. ننگ و نفرت بر این رزیم که﻿ پایه های بنیادینش بر دریای خونی از عزیزترین، شجاع ترین، آگاه ترین فرزندان این خاک و بوم بنیاد شده. The only way to end 34 years of barbarianism by the Messianic Islamist Rapists, “reformers” and all, is Regime change by Iranians for Iranians with the logistical help of the sane world. Backbreaking airtight sanctions plus air naval quarantine is a must.